Be the first to share your favorite memory, photo or story of Darrel . This memorial page is dedicated for family, friends and future generations to celebrate the life of their loved one. 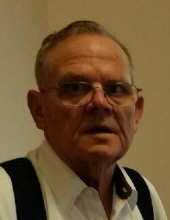 Darrel S. Morris, 74, of Sunnybrook in Fort Madison, Iowa, formerly of Bonaparte, Iowa, passed away at 6:45 a.m., Thursday, April 11, 2019 at his home. He was born November 22, 1945 in Kirksville, Missouri, the son of Harold S. and Gladys I. (Breckenridge) Morris. On June 5, 1966 he married Carolyn S. Parker in Bonaparte, Iowa. She preceded him in death on January 14, 2016. Survivors include two sons: Darren Morris and Darrek (Beth) Morris, both of Hamilton, Illinois; one daughter: Tammie (Jason) Hall of Grinnell, Iowa; two grandchildren: Jaylene Hall of Nashville, Tennessee and Janae Hall of Grinnell, Iowa and one sister: Carol Franklin of Eldon, Iowa. Also surviving are several niece, nephews and cousins. He was preceded in death by his wife, Carolyn, his parents and two sisters, Beulah French and Barbara Roberts. Darrel was a six year member and Staff Sergeant of the United States Army Reserves. He was a member of the Bonaparte Baptist Church, the Keosauqua Masonic Lodge No. 10 and member of General Motors Legion of Leaders Club for ten years. He grew up in Mt. Sterling, Iowa and graduated from Van Buren High School in 1964. He was employed with the Dial Corporation for 28 years in Fort Madison, Iowa and worked at McWhirter’s Chevrolet in Mt. Pleasant, Iowa for 10 years. Darrel also worked several years at the Iowa Army Ammunition Plant. He especially loved his family, family get togethers, visiting with friends and his grandchildren, whom he adored. Darrel also enjoyed going to yard sales and working in his garage. His body has been entrusted to Schmitz Funeral Home of Farmington, Iowa for cremation. The family will meet with friends from 10:00-11:00 a.m., Saturday May 4, 2019 at the Bonaparte Baptist Church. A memorial service is will be held at 11:00 a.m., Saturday, May 4, 2019 at the Bonaparte Baptist Church with Pastor Mark Caston Officiating. Burial will follow at Greenglade Cemetery, Farmington, Iowa with Full Military Rites by the Farmington American Legion Post 231. A memorial has been established in his memory for the Bonaparte Fire Department, the Bonaparte First Responders or Great River Hospice. Schmitz Funeral Home of Farmington is assisting the family with arrangements. On-line condolences to the family may be made at www.schmitzfuneralhomes.com. To plant a tree in memory of Darrel S. Morris, please visit our Tribute Store. "Email Address" would like to share the life celebration of Darrel S. Morris. Click on the "link" to go to share a favorite memory or leave a condolence message for the family.